The third in my series on Flipkart and focus appeared in DNA on April 18th, 2015. 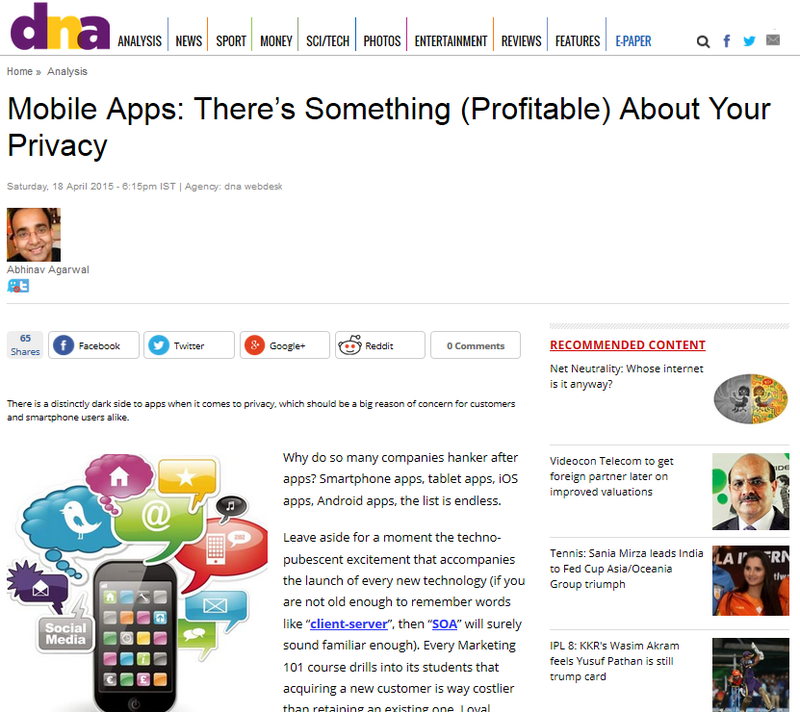 Why do so many companies hanker after apps? Smartphone apps, tablet apps, iOS apps, Android apps, app-this, app-that…. Leave aside for a moment the techno-pubescent excitement that accompanies the launch of every new technology (if you are not old enough to remember words like “client-server”, then “soa” will surely sound familiar enough). Every Marketing 101 course drills into its students that acquiring a new customer is way costlier than retain an existing. Loyal customers (leaving aside the pejorative connotation the word “loyal” carries, implying that customers who shop elsewhere for a better deal are of dubious moral character) are what you should aspire to – that keep buying from you for a longer period of time – and which allows you to refocus your marketing and advertising dollars towards the acquisition of newer customers, faster. If you spend less on unnecessary discounts and expensive retention schemes then margins from existing customers are automatically higher. The second part of my series of articles on why I believed Flipkart was at losing focus, at the wrong time, when faced with its most serious competition to date. 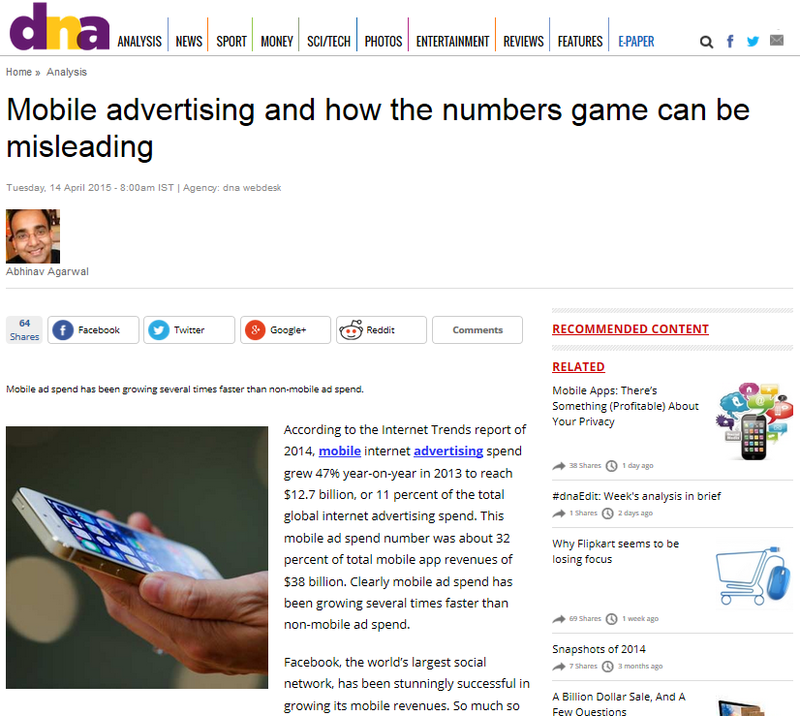 This one focused on why a fascination with mobile advertising numbers could be very misleading. It was published in DNA on April 14, 2015. According to the Internet Trends report of 2014, mobile internet advertising spend grew 47% year-on-year in 2013 to reach $12.7 billion, or 11% of the total global internet advertising spend. This mobile ad spend number was about 32 per cent of total mobile app revenues of $38 billion. Clearly mobile ad spend has been growing several times faster than non-mobile ad spend.